Neisseria meningitidis (Nm), a gram negative human-specific respiratory pathogen, can bind to human α-actinin. Here we present a protocol for visualisation of colocalisation of the bacterium with intracellular α-actinin after bacterial entry into human brain microvascular endothelial cells (HBMECs). 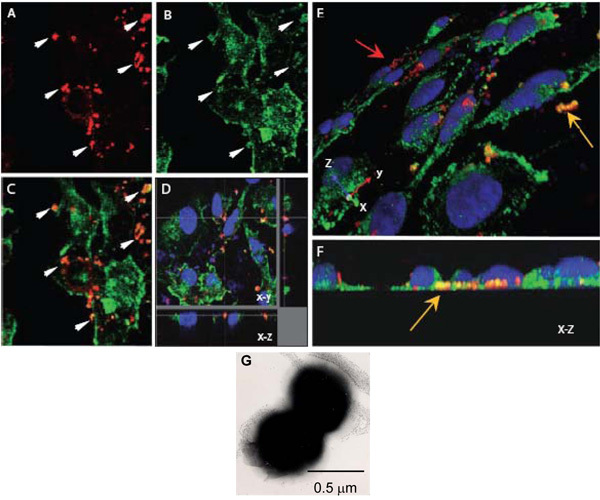 Murillo, I., Virji, M. Visualisation and Quantification of Intracellular Interactions of Neisseria meningitidis and Human α-actinin by Confocal Imaging. J. Vis. Exp. (44), e2045, doi:10.3791/2045 (2010). The Opc protein of Neisseria meningitidis (Nm, meningococcus) is a surface-expressed integral outer membrane protein, which can act as an adhesin and an effective invasin for human epithelial and endothelial cells. We have identified endothelial surface-located integrins as major receptors for Opc, a process which requires Opc to first bind to integrin ligands such as vitronectin and via these to the cell-expressed receptors1. This process leads to bacterial invasion of endothelial cells2. More recently, we observed an interaction of Opc with a 100kDa protein found in whole cell lysates of human cells3. We initially observed this interaction when host cell proteins separated by electrophoresis and blotted on to nitrocellulose were overlaid with Opc-expressing Nm. The interaction was direct and did not involve intermediate molecules. By mass spectrometry, we established the identity of the protein as α-actinin. As no surface expressed α-actinin was found on any of the eight cell lines examined, and as Opc interactions with endothelial cells in the presence of serum lead to bacterial entry into the target cells, we examined the possibility of the two proteins interacting intracellularly. For this, cultured human brain microvascular endothelial cells (HBMECs) were infected with Opc-expressing Nm for extended periods and the locations of internalised bacteria and α-actinin were examined by confocal microscopy. We observed time-dependent increase in colocalisation of Nm with the cytoskeletal protein, which was considerable after an eight hour period of bacterial internalisation. In addition, the use of quantitative imaging software enabled us to obtain a relative measure of the colocalisation of Nm with α-actinin and other cytoskeletal proteins. Here we present a protocol for visualisation and quantification of the colocalisation of the bacterium with intracellular proteins after bacterial entry into human endothelial cells, although the procedure is also applicable to human epithelial cells. The following procedures require suitable safety level tissue culture and microbiological laboratory facilities. Seed HBMECs at 50% confluence (~1.5x104 cells/cm2) on glass coverslips (16 mm diameter) placed into a 12-well plate (3.8 cm2 growth area/well). Growth medium: RPMI 1640 supplemented with 15% heat-inactivated (56 °C, 30min) FBS, 2 mM glutamine, 1 mM sodium pyruvate, 100 U/mL penicillin/streptomycin, 1% (v/v) MEM non-essential amino acids solution and 1% MEM vitamins solution. Culture over night (O/N) at 37°C, in a 5% CO2 incubator. Grow the strain of interest O/N (16-18 h) on the required medium e.g. Brain Heart Infusion (BHI) agar plates supplemented with 10% heated horse blood at 37°C in 5% CO2 atmosphere4. Using a 10 μL culture loop, make a suspension of the overnight bacterial culture in 2 mL PBSB (PBS with calcium and magnesium). Allow large bacterial aggregates to settle by leaving the suspension to stand for 5 min at room temperature (RT). Without disturbing the pellet, transfer the top 1 mL of the suspension (stock inoculum) into a sterile tube. To estimate bacterial numbers in the stock inoculum, add aliquots (20-50 μL) to tubes containing 1mL volumes of 1% SDS in 0.1M NaOH and mix gently to solubilise. Measure the nucleic acid content of the solution by determining the absorbance at 260nm (A260). In our hands, A260 of 1 corresponds to 5x108 colony forming units/ml (cfu/mL). This can be verified by preparing a series of dilutions of the stock inoculum in PBSB, plating out on agar plates and counting colonies after O/N incubation. Dilute an aliquot of the stock inoculum in the infection medium [(M199 supplemented with 2% decomplemented (56°C, 30min) normal human serum (NHS)] to obtain the required bacterial density for the infection of target cells. In our laboratory, an infection ratio of 200-300 bacteria per target cell is routinely used. Wash the coverslips with cultured target cells 3 times with Hank's medium to remove any trace of antibiotics. Infect cells with freshly prepared bacterial suspensions (described above) for 3 h to 8 h at 37°C, in 5%CO2. At the end of infection period, wash cells three times with PBS and fix in 500 μL of 2% paraformaldehyde (PFA) for 30-45 min at RT or O/N at 4°C. Paraformaldehyde fixation at the concentration and time shown above was found to be suitable for preservation of bacterial and cellular morphology. After washing off paraformaldehyde, permeabilise the paraformaldehyde-fixed cells by incubating in 0.1%Triton X-100 diluted in PBS for 10 min. Wash the samples 3 times with PBS. Proceed to immuno-staining or, alternatively, leave samples in 500 μL of 1%BSA/PBST O/N at 4°C. Staining of intracellular bacteria and α-actinin can be performed sequentially or simultaneously by the use of appropriate primary and secondary antibodies as follows; all procedures can be carried out in 12-well plates. After washing with PBS, transfer each coverslip to a new dry well in the 12-well plate. Add the primary antibodies against bacteria and α-actinin; eighty to 100 μL of antibody per coverslip is sufficient if added carefully to cover the surface of the coverslip. Incubate for 1h at room temperature. We used rabbit polyclonal antiserum against Neisseria meningitidis (laboratory-raised) and mouse monoclonal antibody (mAb) against α-actinin (Abcam) simultaneously. In some experiments, in place of anti α-actinin, mAbs against actin or vimentin were used (Sigma). At the end of the incubation, add 200 μL of PBS to the well, lift the coverslip and place in a new well containing 500 μL PBS. After 5 min, remove PBS by pipetting and then add fresh PBS. Repeat twice. Transfer coverslips to a new dry well. Add the appropriate secondary antibodies conjugated to different fluorochromes diluted in 1% BSA/PBST; incubate at RT for 1h in the dark. For bacterial detection, we used anti-rabbit Ig conjugated to TRITC and for α-actinin and other cytoskeletal protein detection, we used anti-mouse Ig conjugated to either FITC- (Sigma) or Alexa Fluor 488- (Invitrogen). At the end of the incubation, wash as in steps 4 and 5. Counter stain with 0.6 μg/mL DAPI in PBS (DNA stain) for 5 min at RT in the dark. Store in the dark at 4°C. Samples are ready for observation under the microscope. To observe and capture images of intracellular bacteria and cytoskeletal elements, we used immunolabelled samples and captured images using a Leica SP5-AOBS confocal laser scanning microscope attached to a Leica DM I6000 inverted epifluorescence microscope. All images were collected using a 63x NA 1.4 oil immersion objective and process with Leica software. To begin the CLSM procedure, add a drop of immersion oil to the objective and place the specimen slide, coverslip-side down, on the microscope stage. Set the microscope to a visual mode and find the area of interest using the eye pieces of the microscope. Using Leica Software, select the xyz acquisition mode. Select the 512 x 512 format (frame size). For colocalisation studies, the higher resolution, the more accurate the image; keeping in mind the resolution limit of the microscope. Then select the bidirectional X mode, which will increase the scanning speed and help reduce photo-bleaching. Set up sequential scanning settings. Click in the "seq" function and choose one of the scanning modes. We use "between lines" mode. Select laser beams according to the fluorochromes conjugated to the secondary antibodies: 405 nm for DAPI (blue), 488 nm for Alexa Fluor 488 (green) and 561 nm for TRITC (red). Activate Photomultiplier Tube (PMT) 1, 2, and 3, respectively. Adjust PMT settings to detect the correct emission wavelength. Set up top ("begin") and bottom ("end") of z-stacks or series. Next, set the required "z-step size". Neisseria meningitidis is a diplococcus (Figure 1G) and since each coccus has an approximate diameter of 0.5 μm, the z-step size of 0.20 μm was chosen to enhance the probability of scanning each coccus at least twice. It is also within the step size for optimum resolution of 0.1 - 0.2 μm. Set the final scan parameters by selecting line averaging of 3 to improve the signal to noise ratio. By clicking "start" double- or triple-stained images are obtained by sequential scanning at different wavelengths to eliminate cross-talk between different chromophores. For an indication of colocalisation of two fluorochromes, select the "overlay" function to merge selected channels into a single image; for example, when both Alexa 488 (green) and TRITC (red) fluorochromes colocalise, yellow color will appear in the overlaid image. Compile z-stacks or series using the "maximum projection" function for the construction of a 2D image required for visualising possible colocalisation. More detailed analysis of colocalisation can be obtained by analysis of each optical section. After acquiring the z-stacks or series, process your data to obtain an orthogonal image for visualisation of intracellular localisation of various elements (Figure 1E). Statistical analyses of the confocal scanning microscope images are performed with Volocity software (Improvision, PerkinElmer). This software provides a tool designed specifically for colocalisation analysis as described by Manders et al.(1993)5. Colocalisation in the context of digital fluorescence imaging can be described as the detection of a signal at the same voxel (pixel volume) location in each channel. The two channels are made up of images of two different fluorochromes taken from the same sample area (Volocity user guide). Statistical analyses are performed with Volocity software (Improvision, PerkinElmer) using Quantitative Colocalisation Analysis described below. Create a library with CLSM images using Volocity software. Select "extended focus" from image in the top bar. This tool will compile z-stacks in a 2D image to be analyzed. Select "Colocalization" tool. The two channels to be analyzed should have the same color depth. Select the area that it is going to be quantified. Set the threshold to remove any background. Create the colocalisation output by selecting "generate colocalization". Colocalisation statistics are generated for regions of interest selected previously. Select Manders' coefficients R (overlap coefficient) and My (colocalisation coefficient). Manders' coefficients are not sensitive to the intensity of staining as they are normalized against total pixel intensity; thus they can be employed when the staining of one antigen is stronger than the other. Overlap coefficient R according to Manders5,6 represents the true degree of colocalisation, i.e. the number of pixels that colocalise compared with the total number of pixels. On the other hand, the colocalisation coefficient, My, describes the fluorescence contribution of the more abundant moiety (in this case α-actinin, green) to the less abundant moiety (in this case bacteria, red), i.e. the number of red pixels that overlap with green pixels compared with the total number of red pixels. Manders' coefficients range between 1 and 0, with 1 being high colocalisation, 0 being none; but they can be expressed as percentage for easier interpretation. Export statistics values to an Excel document for data presentation. Confocal imaging of human brain microvascular endothelial cells infected with Nm for 3 and 8 hours as described above indicated colocalisation of α-actinin and Nm which appeared to be less frequent in 3 h infection experiments (not shown) compared with cultures infected for 8 h (Figure 1 A-F). A demonstrable colocalisation of α-actinin with Opc-expressing meningococci was observed each time in >5 replicate experiments. Statistical analysis of colocalisation using several confocal images was carried out as described above. Overall, in HBMEC infected with Opc-expressing meningococci, >25% overlap of the green (α-actinin) and red (Nm) pixels was obtained (Figure 2B, Overlap coefficient R). In contrast to α-actinin, experiments in which labeling of internalised bacteria and either actin or vimentin was performed, occasional colocalisation was observed with actin but that with vimentin was rare (Figure. 2B). The data were also analyzed using the coefficient My, which takes into account the relative abundance of each moiety. My is a measure of the frequency of occurrence of the more abundant signal (in this case green, α-actinin) each time the less abundant signal (in this case red, bacteria) occurs. This measure shows a striking level of occurrence of α-actinin in the vicinity of internalised meningococci (Figure 2A and C). Figure 1. Confocal laser scanning microscopy to assess intracellular interactions of N. meningitidis with α-actinin. A-H. Confluent endothelial monolayers grown on coverslips were infected with the Opc-expressing (A-F) N. meningitidis. After 8 h, non-adherent bacteria were washed off, cells fixed with paraformaldehyde and permeabilised with 0.1% Triton X-100. Subsequently, bacteria and α-actinin were stained as described above (α-actinin, green; bacteria, red). A-C. One field showing x-y images of the location of Nm (A) or α-actinin (B). The overlay image in (C) indicates several regions in which yellow-orange color appears suggesting colocalisation. Arrows in (A) and (B) show regions where a high degree of α-actinin accumulation appears to have occurred around bacteria. D. Optical dissection of an infected HBMEC monolayer indicating colocalisation around intracellular bacteria located at the base of a cell. Again, this colocalisation is not due to accidental proximity of α-actinin, as the general stain of α-actinin in this region is low. E and F. Three-dimensional images of infected HBMEC monolayers processed as above. An oblique view of the apical surface (E) shows adherent bacteria stained red (red arrow) whereas several bacteria located towards the basal surfaces of endothelial cells (yellow arrow) are distinctly orange/yellow in color. Basal location can be more clearly seen in (F) which is an end-on X-Z cross-section. G. A negatively stained electron microscope image of N. meningitidis showing its predominant diplococcal from. Each coccus is approximately 0.5 μm in diameter. Figure 2. 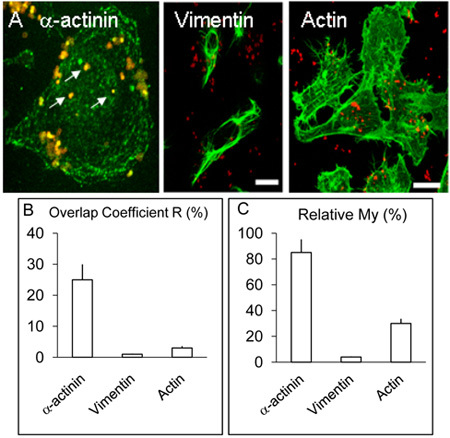 Localisation and distribution of α-actinin, actin and vimentin in HBMEC cells. A. Infected monolayers of HBMEC were treated as described in the legend above but in addition to α-actinin, some coverslips were used for the detection of actin or vimentin by procedure similar to that for α-actinin. As above, α-actinin concentrated around several internalised bacteria (white arrows). Vimentin and actin did not colocalise with bacteria to appreciable levels. Bar represents 20 μm. B. & C. The values for the coefficients R and My were obtained from more than three experiments using Volocity software as described above. The possibility of binding of internalised Opc-expressing Neisseria meningitidis to α-actinin was explored using HBMEC by the examination of the colocalisation of bacteria and the cytoskeletal protein in infected cells after 3 and 8 h incubation period. By confocal microscopy, colocalisation of Neisseria meningitidis with α-actinin could be demonstrated. Notably, although bacteria were internalised at 3 h, there was little colocalisation with α-actinin at this time point. Bacterial association with the cytoskeletal protein appeared to require a longer period of intracellular residence as after 8 h infection period, significant numbers of bacteria had α-actinin apparently in close association. Alpha-actinin is a multifunctional protein, and bacterial interactions with the cytoskeletal element could have significant influence on the target cell function which is a subject of current studies. Quantification of colocalisation as described above requires meticulous specimen preparation. Particular attention should be given to specimen fixation, blocking period and antibody dilutions. For the best signal to noise ratio, each primary and secondary antibody should be titrated in preliminary experiments to determine the optimum concentrations. In our experience, the mounting medium Mowiol produced better images. The studies were funded by the Wellcome Trust and Meningitis UK. HBMEC cell line was provided by Dr K.S. Kim. Confocal imaging and electron microscopy were performed in the Wolfson Bioimaging Facility, University of Bristol. We would also like to thank Mr Alan Leard, Dr. Mark Jepson (University of Bristol), and Mr. Alan Tilley (PerkinElmer) for their help and advice. Leica SP5 confocal imaging system: This system, by using a combination of AOTF (acousto-optical tuneable filter) and an AOBS (acousto-optical beam splitter), simplifies excitation with specific wave lengths. Leica confocal software LCS, Leica Microsystems, Germany. Volocity 5, Improvision, PerkinElmer, USA. Virji, M., Makepeace, K., Moxon, E. R. Distinct mechanisms of interactions of Opc-expressing meningococci at apical and basolateral surfaces of human endothelial cells; the role of integrins in apical interactions. Molecular Microbiology. 14, 173-184 (1994). Virji, M., Makepeace, K., Peak, I. R., Ferguson, D. J., Jennings, M. P., Moxon, E. R. Opc- and pilus- dependent interactions of meningococci with human endothelial cells: molecular mechanisms and modulation by surface polysaccharides. Molecular Microbiology. 18, 741-754 (1995). Sa E Cunha, C., Griffiths, N. J., Murillo, I., Virji, M. Neisseria meningitidis Opc invasin binds to the cytoskeletal protein alpha-actinin. Cellular Microbiology. 11, 384-405 (2009). Virji, M., Kayhty, H., Ferguson, D. J., Alexandrescu, C., Alexandrescu, J. E., Heckels, E. R. The role of pili in the interactions of pathogenic Neisseria with cultured human endothelial cells. Molecular Microbiology. 5, 1831-1841 (1991). Manders, E. M. M., Verbeek, F. J., Aten, J. A. Measurement of colocalization of objects in dual color confocal images. Journal of Microscopy. 6, 357-382 (1993). Zinchuk, V., Zinchuk, O., Okada, T. Quantitative colocalization analysis of multicolor confocal immunofluorescence microscopy images: pushing pixels to explore biological phenomena. Acta Histochemica et Cytochemica. 40, 101-111 (2007).